Game is IJ93. I've got 11629 on the right and 15411 on the left and both are too strong, the right one more so than the left. What are acceptable weaker coils to use? I've read that 11630 for the right might be better. The balls are flying off the ramps. I just got the game a week ago and previous owner said he had rebuilt the flippers. Based on the manual I have, 11629 appears to be stock. Williams knew the games wouldn't be maintained, so stronger coils were used. You keep the game clean, waxed, new balls. You can go weaker. Make shots. And not break stuff. Thanks Lloyd, seems like I should try 11630 in both flippers. Sounds right, My STTNG had 11692s in it when I got it; When I rebuilt the machine I put in the original 17636 that the manual called for but they seem to be too strong (air balls off every target). I may drop down to 11630 for the main flippers and keep the 17636 in delta ramp flipper. I posted on RGP, but thought i'd keep this topic going here too in case someone isn't on or checking RGB. My game was set at 5 degrees so I changed it to 7 degrees pitch. Helped a little, but not nearly enough. for FL11629 I get readings of 139 (first to second lug) and 143 (first to third lug). Charts suggests it should be closer to 133. bad coil or diode(s)? for fl15411, I am getting 137 and 142 compared to 150 suggested in the chart. not sure what to look at next, if I've measured correctly or how to interpret what I'm seeing. You don't have bad diodes or coils. If you did you'd be blowing stuff up. Transistors for a start. You are taking better care of your machine than the manufacturer thought would happen. Go to a weaker coil if you like. Update: replaced the coils, much better. I'm still getting balls flying off the left ramp at times, but it's a lot better overall. 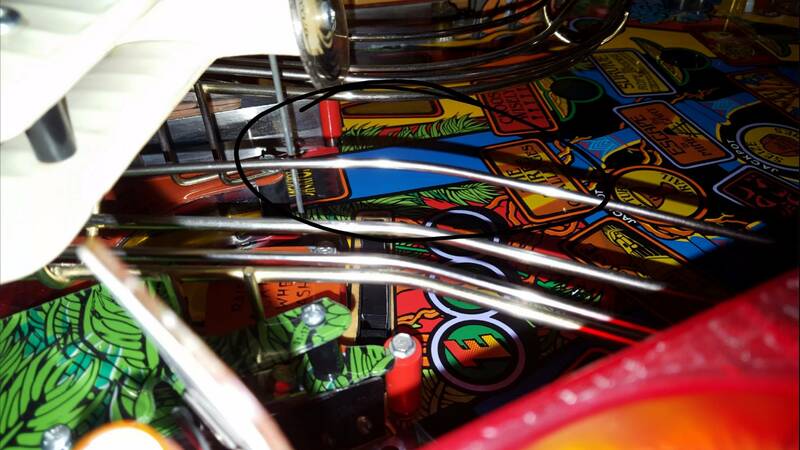 Maybe that right flipper needs to be even weaker, or I need to figure out how to keep the ball on the left ramp. 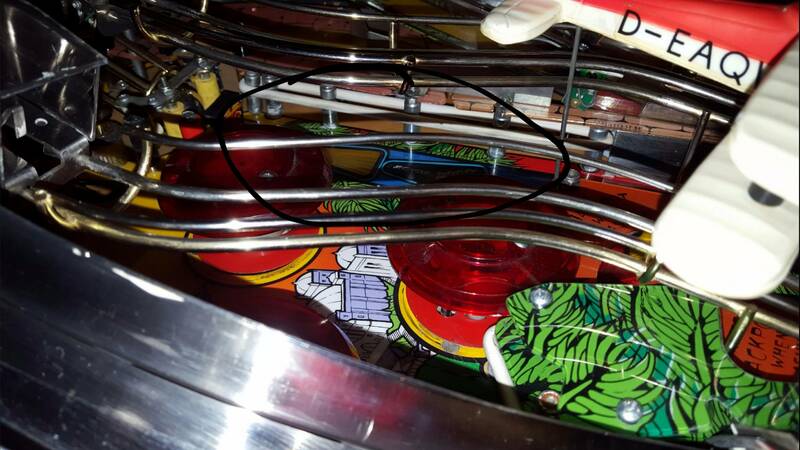 I installed 11630 flipper coils about 4 years ago in my game. With the rear legs at maximum and the front legs at minimum, I only get a left ramp fly off every once in a while after a fresh wax (although I might have a little slop in the flipper linkages at this point). Overall I think they are the best strength coil for the game. I also used Stern red tapered posts instead of black ones mid way up near the ramp entrances, etc. to prevent air balls. This games really needs some fine tuning to make it a solid experience. Particularly if the mode start hole is worn. I wound up bending the left ramp a bit along the side walls and no more airballs off the ramp. With the 630 coils, the shot up the poa ramp can be tough sometimes, but I like it that way...shots shouldn't always be so easy and you have to work to make the shot. I could always put the 411 back on the left flipper. No issues with mode shot, hit it cleanly and it stays in, shouldn't always be a slam dunk. Such a great game. Having same issue with right flipper being too strong. Shots up left ramp with right flipper fly off by the plane 4/5 times. I ordered a pair of FL-11630 but not sure if I should replace both flippers or only the right one? My left flipper seems fine strength wise but not sure if it will feel weird to play a game with two different flipper strengths? but not sure if I should replace both flippers or only the right one? I'd do both. Your single drop target in the back will live longer.